There is no other oil in the world quite like Monoi de Tahiti Oil. It can only come from one place in the world and is always created using the exact same refinement process. A process that has been repeated and somewhat improved through centuries of use in the area. The refinement and manufacturing process of authentic monoi oil is very strict. These strict guidelines adhere to very old tradition, allow the product to receive quality certifications, and help it to stand out from the dozens of imitation oils that have surfaced on the market. Such care is taken with the production of authentic Monoi de Tahiti so that the integrity of the ingredients can be maintained. The final product can deliver powerful benefits, including UV protection, skin moisturizing, and hair repair. The manufacturing codes set in place regulate how each stage of production should be handled, starting from the moment the first flower is picked until the finished product is shipped to suppliers. 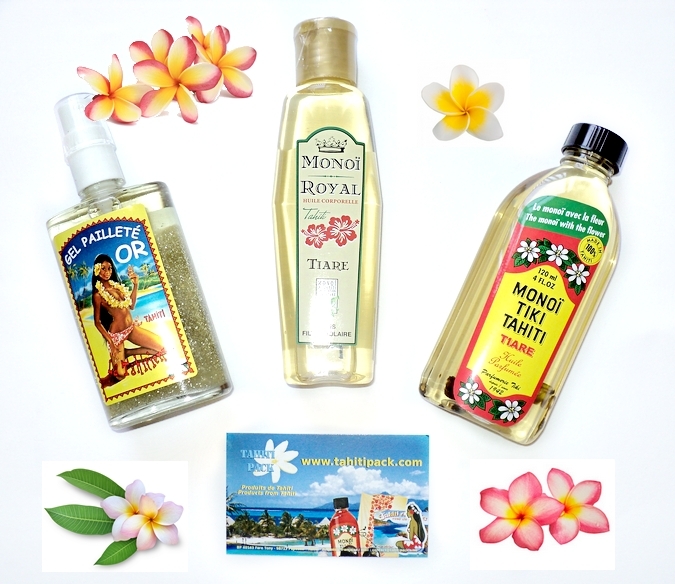 What Is In Monoi De Tahiti Oil? Monoi oil is not some extremely complex proprietary formula with hundreds of strange chemicals working together. It is completely natural and so simple that it really only contains two primary ingredients. One ingredient is the Tiare flower and the second is refined Coconut Oil. The Tiare flower is very popular throughout French Polynesia where it is a common sight. The flowers are picked before the bud has opened. They are then transported to a facility where the pistils are stripped away and the remaining flower is placed is a container of coconut oil. 15 flowers are used for each single liter of coconut oil and they remain in the oil for at least 15 days. The coconut oil itself must go through a very strict refinement process as well. One that has not changed much during the past thousand years. Could such a simple combination of ingredients really be so powerful? Here are just a few of the amazing benefits that can come from using this versatile oil. Starting from the top are benefits for the hair. Monoi de Tahiti oil can benefit hair in different ways depending on how it is applied. Monoi oil is an active ingredient in several high-quality hair care products because it leaves the hair hydrated after use. It may be found in conditioners, serums, and shampoos. It can also be used on its own as a pre-shampoo treatment. The oil should be warmed and applied thoroughly to the hair. It then helps repair the hair follicles, reduce frizz, and prevent hair breakage. Monoi oil has been used for hundreds of years as a source of protection against the sun, wind, and sea. The oil creates a thin protective barrier that reduces the impact of these various elements. It was once used by Maori navigators during canoe trips at sea to protect their body from cold, wind, and salt. Modern divers still apply monoi oil to their bodies before diving for the same reasons. It could be applied to newborn children to fight off dehydration during the hot months. In the winter, it protects their body from the cold. In the same way that it protects the body in sea water, it can protect the body when swimming in a pool. The chlorine and other chemicals used in pools can have damaging effects on the hair and skin. Monoi de Tahiti oil can greatly reduce the impact of these chemicals. It also benefits the skin in some other ways, aside from the protection it offers. The flower and oil mixture works as a powerful moisturizer. It can be applied directly after taking a shower to keep the skin hydrated throughout the day. The flower has several medicinal properties that are transferred into the oil during the manufacturing process. The oil can be used to alleviate the pain and symptoms of sunburn. It is also often used as a warm massaging oil. Monoi de Tahiti oil may very well be the world’s most versatile oil. It is a very simple mixture, yet its two ingredients have so many beneficial properties that the end result can be used to protect the body, repair the skin, or improve hair. Directly by Biocos Laboratoires the new Lovea bio line: a collection of sun care products for the whole family, free from parabens, silicones, dyes, phenoxyethanol, peg and artificial fragrances. Delicious 99% natural Tahitian Monoi, without sunscreen. Provides ultra-fast tanning, nourishes and smoothes skin and hair. This Tahitian Monoi Oil formula hydrates, nourishes and smooths your skin whilst helping you develop an ultra fast tan. This oil has a double use as it can also be used as a hair mask for dry and damaged hair, giving your hair an intense brilliance and making it feel ultra-soft to the touch, making this product an essential for your beach bag! Does not offer any UVA or UVB protection. Spray with Tahiti Monoi, real beauty secret of tahitian women. Helps to achieve a nice tan thanks to non-greasy and non-sticky formula. Complex of active photo-protectors that ensure optimal protection against UVB-UVA rays long and short. It moisturizes the skin and makes it soft and smooth as silk. Spray tanning milk, Waterproof formula. Lightweight texture that penetrates quickly and does not stick and no white marks. Milk fluid, easy to apply, specially designed to protect the skin from the aggression of the body of the sun’s rays. Prolongs the tan and keep your skin hydrated. The Monoï Royal is made up of Tiare flowers soaked in refined coconut oil. This flower with its unforgettable perfume only grows in Tahiti. We recommend his use for: moisturizing skin, long-lasting (maintaining) suntan, reanimating the silky and brilliance of hair. Very refined in the evening, it emphasizes a low neckline and stresses the bronzing while easing the skin. Perfumed Oil made from coconut oil and Tiare flowers gardenia tahitensis, when applied directly on the skin to nourish and hydrate sustainable, the monoï provides a delicious sense of exoticism. A few drops paid in the bathwater give softness and a delicately scented to your skin and hair. io AMO il profumo di Monoi, è estate pura per me!!! I’ve never try this oil before but it seems great! I had some cosmetics with monoi oil and I remember, they was very good. Non ho mai provato questo olio, deve essere ottimo! Ooh. Would love to have these products. a me piace moltissimo questo olio, sa proprio di estate! Monoi è il top da sempre per ciò che concerne abbronzanti! E che profumo queste creme e olii …. Aw super cute package! Lovely post, thanks for sharing! Lo conosco: é un olio fantastico! Bene… da provare senza dubbio!!! 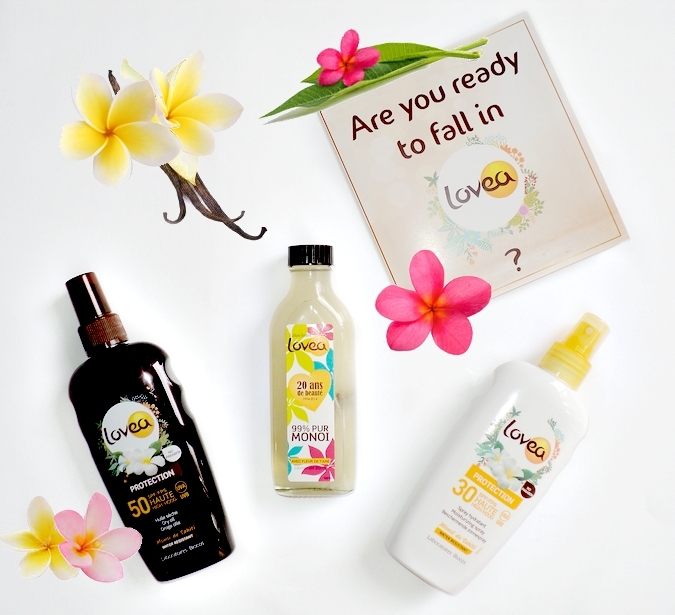 You can send me some organic Lovea suncare products :) I like parabene free products. The sun spray is the one I would prefer since it doesn’t stick. I really interesting review here.